In the aftermath of the Iranian attack on Saudi Arabia's embassies, Lee Smith writes that the Obama administration has given the Saudis contemptuous treatment that has only been matched by Obama's treatment of one other ally: Israel. President Obama has said that the United States shouldn't take part in a sectarian war. White House officials have let on that it's wisest for the United States to stand aside while extremists from both sects kill each other off. But the administration has effectively sided across the region with Iran and its allies, including Hezbollah and Iranian-backed Shiite militias in Iraq, and even the Revolutionary Guard Corps itself, providing air cover for the operations of Quds Force chief Qassem Suleimani in Iraq. John Kerry has finally admitted that the administration has no interest in toppling dictator Bashar al-Assad, Iran's ally in Damascus. As Obama has explained, the White House acknowledges Iranian interests in Syria — which happen to include shipping missiles to Hezbollah to point at Israel. With the Nimr affair, the Obama administration again showed its preference for Iran. After the Saudi embassy and consulate were torched, the first statement the State Department released made no mention of the attacks but questioned the wisdom of executing Nimr. Officials were eager to put distance between the United States and the Saudis, claiming the administration had tried to dissuade Riyadh but to no avail. Why was the White House effectively backing Iran's position, a self-arrogated "right" to have a say in the fate of a citizen of another country? After all, Iranian foreign minister Mohammad Javad Zarif tells Kerry that the fate of Iranian-American Washington Post reporter Jason Rezaian is none of America's business since he's an Iranian national. "Shortly after they started getting questions about the incident, the administration began furiously briefing reporters against the Saudis," says Omri Ceren, an analyst with the Israel Project. "It's difficult to think of any other country, with the obvious exception of Israel, that's ever received that kind of treatment from the White House's communications team." Large parts of the American press and foreign policy community took their cue from the White House and went on the offensive against Saudi Arabia. The fundamental theme was that Americans share many values with Iran, but not with the Saudis. This, though neither Riyadh nor Washington are in the habit of directing their citizens to attack embassies. Saudi Arabia is an often trying U.S. ally, unfree, a violator of human rights, with private citizens who back terrorism. But for the last decade, Saudi Arabia has been a partner in the war on terror. Most of the 46 others executed with Nimr were Sunni Islamists, including al Qaeda members. "Crown Prince Mohammed bin Nayef has an impeccable record in fighting Islamists," says Hussain Abdul-Hussain, Washington bureau chief of the Kuwaiti newspaper Al Rai. "Now Saudi has its Islamists on the run and sees Iran as the main threat they have to deal with." Abdul-Hussain says that this new policy focus is also partly due to the difference between the former king, Abdullah, and the current ruler, Salman. "Abdullah didn't want to get involved in regional politics. But with Salman, the White House has asked the Saudis to do so many things and carry the ball on their own — whether it's Syria, Yemen, or to stand up to Iran. But now the administration is saying they don't like it that way. If you're Saudi, it seems that no matter what you do, the Americans won't like it." What's especially peculiar about the White House's attitude, says Abdul-Hussain, is that the Saudis are a status quo power that, in its foreign policy, essentially plays by Western rules. "They believe in the nation-state. For instance, they gave the Lebanese Army billions of dollars to buy weapons from France in order to buttress a national institution. The Iranians are a militia state that supports militias around the region. In Iran, the supreme leader is more powerful than the president, the IRGC is stronger than the army." 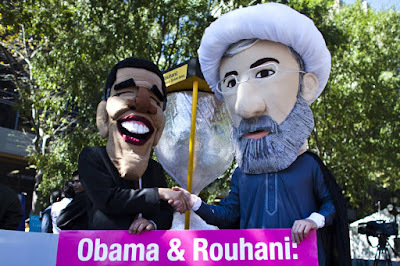 Exporting the Islamic Revolution means replicating that system elsewhere. In Lebanon, Hezbollah is stronger than the army. Hassan Nasrallah, the head of Hezbollah, makes foreign policy, not the Lebanese prime minister. "Iran is doing the same in Iraq," says Abdul-Hussain, "where they back the popular militias, which are stronger than the central government in Baghdad." It's hardly a surprise that the regime in Tehran continues to violate international laws and norms, laying siege to diplomatic missions and testing ballistic missiles in violation of U.N. Security Council resolutions. The revolution has always aimed to overthrow the existing order of the region and the rest of the world. What's striking is not just that the White House has turned on so many American regional partners, from Israel to Saudi Arabia, or that it's undone an American system that took 70 years to build, but that it so often ends up taking Iran's side.